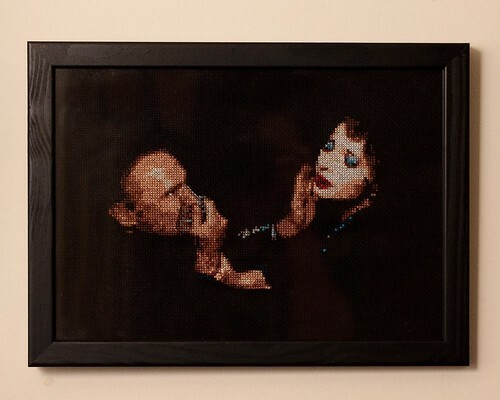 How amazing is this Blue Velvet cross stitch by poppet with a camera? I was even more shocked when I saw these progress photos that revealed her stitching the piece using just a screenshot as a reference. Who does that? Someone awesome. She was kind enough to answer my questions on her piece, and she revealed that she usually works from a "rough pattern," switching back and forth between that and the screenshot for reference. I love the gorgeous jewel-y colors she chose, and the black Aida background. Sheesh it's amazing. 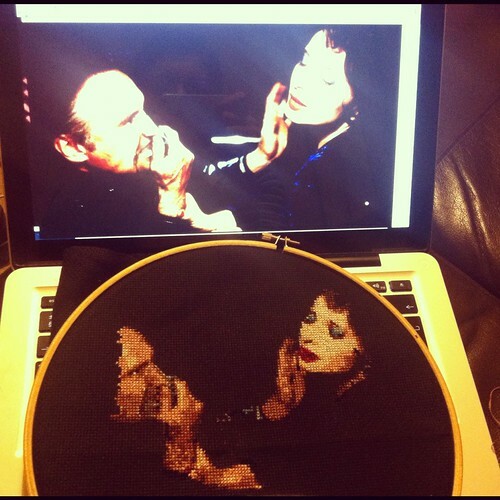 And, if you haven't seen Blue Velvet, this commemorates probably the creepiest scene in the whole movie. Awesome work, poppet with a camera! I can't believe this done from a screenshot on screen. Those are some impressive stitching skills!